Over the years, I have had reason to recommend a patient use amplification for their voice. To save patients the hassle of trying to find a good quality amplifier, I decided to try to find one I could provide directly to patients. I have tried several voice amplifiers to judge quality and also to get a good price point that patients are comfortable with. The unit I will be selling performs quite well, and even at higher volume retains good voice quality without any distortion or feedback. A number of patients have told me that they can hear themselves better when performing voice exercises, and hence perform them better. Others have found that their hearing impaired spouses are pleased with being able to hear them, and others tell me that it makes it easier to concentrate on what they are saying than how loud they are talking. I had a patient recently with Parkinson’s and Lewy Body, a retired teacher, and I honestly couldn’t understand more than 25% of what he was saying during the evaluation. His wife, consequently, did all of the talking. It was such a struggle for him to get his voice on, that once he had voice, he didn’t know what he wanted to say. On the second visit back, I placed an amplifier on him, and he literally spoke to me for the full 50 minutes, answering questions about his life and teaching, and showing a sense of humor that often reveals itself once you can hear an individual. For patients with vocal fold impairments such as nodules or paralysis, use of a voice amplifier can reduce the impact of voice symptoms and help with day to day communication. The auxiliary input allows you to use the amplifier as an external speaker with computers and other electronics, and while using it for this purpose during a recent seminar, I found it provided more volume than two other external speakers I own. Feel free to contact me with any questions. Voice Aerobics offers programs and products designed to improve and support the way you use your voice. Home-based programs like Voice Aerobics™ DVD and Voice Aerobics™ Songbirds audio CD can be used independently by persons with voice changes from muscle weakness, age related changes to breathing and voice, or problems from voice misuse. The Voice Aerobics Amplifier is an affordable solution to anyone needing more power for their voice whether teaching, preaching, or just talking to the family. We receive numerous email questions about how our products can help with voice and breathing and we encourage you to read what others have asked to determine if our products are right for you. 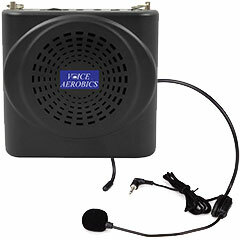 Visit our Shop and check out the latest Voice Aerobics Products available. Still not sure? Drop us a line. We also love to hear from satisfied customers. Your feedback helps us help you! Amplifiers are charged when they leave the factory and checked again before shipping. Failure to follow enclosed instructions for charging may cause damage to your amplifier. If you are planning only occasional use of your amplifier, be sure to charge at least monthly. Failure to do so may result in your amplifier not working. Amplifiers which stop working due to poor maintenance will NOT be replaced. Refer to additional warranty information enclosed with your purchase.